Loved my plants. I can not believe one has blooms pods on it already. Lovely company. This plant arrived intact and unbruised. It is growing. Vigorously already just two days after delivery. Cute plant! Hard stem Bulrush thrives in wetlands environments. It’s hardy and resistant to drought. Reaching a mature height of four feet, this fast grower will spread quickly, providing shelter for wildlife year round and food in the winter. Its blooms will add springtime interest too. Hardstem Bush is vital in reducing erosion and acts as a buffer against water and wind. Also known as tule, it is great for planting by lakes, marshes, and garden ponds in zones 3 through 9, and it does well in brackish, saline, and alkaline soils making it an adaptable plant. 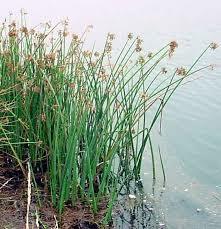 Hardstem Bulrush will grow in ponds and other bodies of water this bull rush can survive up to five feet of water. These tall plants have smooth green stems that have brown flowers at the tips. They are native to North America and Europe. Birds and other various creatures eat and live in this type of bulrush. This kind of bulrush grows in North America and is very hardy. It is a hard type of bull rush that can handle too much or not enough water. The blades are a greenish yellow color and are flat rough and limp. The bracts very but there is always one that is larger than the inflorescence. The Hard stem Bulrush flowers that bloom in mid-summer can be multiple shades of brown and yellow. Hardstem Bulrush is beautiful plants for around your garden, lawn, pond or pool. Don't limit ornamental grasses to beds and borders in your landscape. Grow them in containers to add drama to decks and patios. Annual or tender grasses, are especially useful choices for growing in containers because you need to replace them again in spring anyway. Grasses like Hardstem Bulrush are a great accent plant for beds and borders and complement neighboring perennial flowers. This grass plant is terrific, and they grow back each year after being planted. Hardstem Bulrushes are also great as they can help with soil erosion problems around bodies of water.